If any organization knows how to combat cyberattacks, it’s the Pentagon. Attempts to breach its network are legion – but so is its rate of success at foiling such attempts. 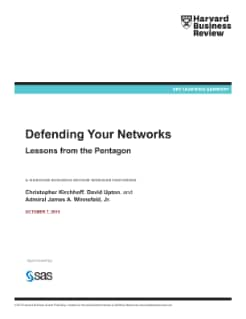 What can we learn from the Pentagon about culture change and safeguarding business networks from cyberattacks? Find out in this paper, which draws from points shared by experts in a Harvard Business Review webinar.